This article by Joe Szimhart will be of interest to all those studying Ramtha, but also to anyone following the activities of CESNUR - of which Reverend Gordon Melton is a director - and his colleague Massimo Introvigne. Gordon Melton is a pastor of the Emanuel United Methodist Church in Evanston, Illinois and book collector. He is the President of the Transylvanian Society of Dracula, a picturesque association devoted to vampire lore. He is also runs the Institute for the Study of American Religions (ISAR), and directs CESNUR-USA. In this role, he signed a passionate appeal in support of Scientology. In exchange, the Scientology-run new "Cult Awareness Network" promotes him as an "expert". A full analysis of the activities of Gordon Melton can be found on Apologetics Index. From Massimo Introvigne to Eileen Barker and J. Gordon Melton. By Tilman Hausherr, 1999. Gordon Melton visits Japan at the expense of the Aum Shinrikyo cult, and denounces "religious persecution" against the sarin organisation. Gordon Melton, after having attended a Scientology wedding, certifies that "the Church of Scientology is very much a religion in the fullest sense of the word." Evidence is not lacking: "the Church of Scientology regularly holds its Sunday worship service which, though not the main focal point of the week as in the Methodist Church, nevertheless provides the community worship for the group." By Joe Szimhart, July, 1998. Comments, corrections and criticisms are welcome. Thanks to Rick Ross for this article, taken from his critical page. J. Gordon Melton, 1998. Finding Enlightenment: Ramtha's School of Ancient Wisdom. Beyond Words Publishing Inc. 20827 N.W. Cornell Road, Suite 500 Hillsboro, OR 97124-9808 1-800-284-9673 ISBN 1-885223-61-7 216 pages. Hardback. $17.95. As I read Finding Enlightenment, I found I could not put it down for long until I finished it. I have been studying the Ramtha movement since 1984. I came away from my reading with mixed reactions. This book, in my view, fits a pattern of scholars for hire who will write favorably about controversial groups but habitually devalue critical information. The author has developed a reputation among religious scholars as somewhat of a maverick who concentrates on new religions, cults, and hundreds of relatively small sects that pepper American spirituality. His Institute for the Study of American Religion, located in Santa Barbara, CA, small as it is, has an impressive archive. Sociologists, students of religion, and journalists have often turned to the ISAR for information and comment about controversial sects and cults. Melton has positioned himself among a clique of academics who actively oppose what they label as the "anti-cult network." The "ACN" has basically been a loose network of religious and secular groups, ex-cult members, and concerned families who seek to end the harm that some cults do by providing information and research. The ACN may also assist ex-members to recover from harmful experiences. Some elements of this network have supported interventions like deprogramming and exit counseling. The antagonism stretches into the courtroom where many heated disputes over failed deprogrammings, undue influence lawsuits, and child custody cases end up. Ramtha has been a target of the ACN, therefore Melton defends it--not that this makes academic sense. In the Knight vs. Knight case (1992-95 in Tacoma, WA), I was the initial witness on behalf of Jeff Knight, who sued ex-wife JZ over the divorce settlement. Jeff alleged that JZ kept significant assets hidden from him, and that he was yet under the undue influence of Ramtha when he settled initially. For several years Jeff avoided treatment for his HIV infection because he yet believed that the "Ram" and the C&E breathing technique taught by JZ could protect and possibly cure him. Apparently, JZ was not infected, but the delay in treatment for Jeff may have cost him years of a productive life. We will never know. By 1991 he was broke and too weak to work steadily. After the evidentiary hearing, the judge awarded Jeff and his team expenses only. He died at peace with himself, according to his mate, Geoff, and family, in 1994 before he could carry an appeal further. Melton includes little information from Jeff Knight regarding the development of the Ramtha myth and school. What information he offers is filtered through JZ's autobiography and perspective. This is one example why Finding Enlightenment is primarily an extension of Melton's court testimony, not a serious venture into research. In 1980, Master Jeffrey (all students were "masters" in Ramtha's school), qualified as JZ's "soul mate" in Ramtha's eyes. Jeff shared the stage with JZ/Ramtha during most of Ramtha's appearances in the early years until 1987. Jeff also had direct access to Ramtha, day and night, whenever he was around JZ over five years, until she found a new companion. Jeff heard what others never heard from the Ram. This is one, important "backstage" reality that Melton's book ignores. The book includes 8 chapters, an epilogue, appendix, extensive endnotes and references, but it lacks an index. The author begins with his personal experiences with the RSE in the early 1990s. He then gives us a short biography on JZ Knight, and how she came to meet and later channel a "35,000 year old spirit" that first appeared to her in her kitchen. Before describing how the "Ramtha myth" developed, Melton digresses into a summary of Gnosticism and why the RSE is a form of "modern Gnosticism." In his chapter, "Ramtha's Philosophy," Melton summarizes JZ/Ramtha's penchant for oblique references to quantum physics, appropriations from New Age occultism, and for a reinvention of the Indian chakra system--Ramtha called them "seals." In Gnostic style, the Ramtha school teaches that we have, through countless rebirths, forgotten that we are "gods" or sparks from the Divine essence. RSE offers taped lectures, techniques, and "fieldwork" at JZ's ranch in Yelm, Washington. The central technique, Melton informs us, is the C&E (consciousness and energy) breath ritual introduced by JZ to the school in the late 1980s. C&E is not unlike the earlier New Age "holotropic breathing" psychotherapy developed by Stanislav Grof. C&E is also derivative of pranayama or yogic breathing techniques from ancient India. Melton has nothing to say about these connections, save that JZ Knight was aware of many earlier occult traditions and writings. RSE students utilize blindfolds often at events. In one event, hundreds of students wander blindfolded around a large, fenced field in search of their posted symbols on cards pinned to the fence (photo on page 91). The "tank" also requires blindfolds when students meander through a makeshift maze of colored, eight-foot panels for hours at a time. Students may find holes that lead under ground into "worms" or tubes where they crawl until they find their way out. Melton does not record an event around 1990 when JZ/Ramtha directed around 1,000 students to split up some distance across from each other in the field. Although they were blindfolded, at Ramtha's command, most of them ran across the field with the hands in C&E position in front of the chest, whooping and yelling. Quite a few crashed into one another and some of them were injured. Timid older ladies stood frozen along the fences. One of my clients, who was a participant in this singular mayhem, said it was supposed to help them get over fear. He ended up with a deeply bruised shoulder and an egg-sized lump protruding from his forehead. He believed that a few people had to be treated at the hospital. Fear motivated this man with the bruised head to bond with the Ramtha teachings. Melton hardly reports on the dramatic survivalist activity that dominated the group between 1988 and the early 1990s. The Last Waltz of the Tryrants (Koteen, ed., 1989) was the teaching by Ramtha about the "endtimes" and coming catastrophes. Specific instructions from Ramtha included leaving your mates if they resisted or disagreed with you. Ramtha also taught that "your government is an illusion" which supported tax evasion among the students. The world is to be like Ramtha "knew it" by 2042, a prediction of massive earth changes and a return to a primitive life. Ramtha devotees at the time heard an ominous directive from JZ/Ramtha: "When the dragon marches, be prepared to hibernate." Translated into real-speak, this meant that the students should have their "hovels" (secret, individual underground shelters with provisions) ready in case the immense contingent of Communist Chinese soldiers in Mexico decide to raid Seattle and the area. Melton does not report on these many underground shelters (he reports "several" did it only on page 199 in his notes), nor does he give details about this important, survivalist, anti-government aspect of the RSE. [No, there are not, nor have there been, hundreds of thousands of Chinese soldiers in Mexico, but this has been a favorite conspiracy theory of some fanatic, right wing survivalists]. Melton avoids accurately reporting how deeply affected Ramtha students were by these survivalist dictations. He wants to avoid "sensationalism" in an attempt to reflect his perceptions of the group's current image. He also wishes to respect the "secrets" of the closed society that is the RSE. On page 165, Melton states: "...the scholar must be careful to respect the group and not violate the group's sense of the sacred." In the endnote on page 203 he hints at his philosophy for studying these groups: "Every time a violation of trust occurs, it becomes that much harder for the next person who seeks access to a group. Such a violation can occur when a scholar gains the group's confidence and trust merely to use the information gained to attack or expose the group in a polemic manner." This last statement is at the core of the apologetic clique that Melton represents. They are afraid that a group will not let them study or report research if the truth about abuses and lies is revealed. Melton is more interested in access than truth or accuracy. If an ex-member or critical scholar reports on a group, he calls it an "attack" or a "polemic," but he does not encourage investigation to determine the accuracy or truth of the "attacks." He does not wish to offend the group. No wonder some scholars have voiced concerns (Zablocki, 1996; Balch in Wolves in the Fold by Shupe, 1998). Melton does state, in an endnote, that the RSE is "not a nice place," is difficult and "very different from New Age workshops" (202). It may be different than most, but Melton ignores how abusive or "demanding" as he calls the RSE, many New Age, mass therapy workshops have been. He must certainly know about the early est that derived from Mind Dynamics Institute (folded under lawsuit in early 1970s)--a brutal experience in "self-development" (many called it brainwashing) that combined intense encounter groups, hypnosis, and military bootcamp activity into weekend sessions. He could have also compared RSE to Scientology's "RPF" programs, or to some controversial Outward Bound style programs. He could have pointed out that most thought reform (brainwashing) programs derive much from old military training techniques. But Melton is on record as stating that the "social science community" has stated that "brainwashing" does not exist. RSE's rigorous, physically demanding approach to thought reform is nothing new nor unique, as Melton implies. All of the RSE exercises, including C&E and "paradise beach" (sitting for days alone in a field with few provisions), purport to open psychic awareness and powers like remote viewing. The dreaded "death hormone" discussed by Ramtha can also be eliminated through C&E. Lately, a recent ex-member reported to me that Ramtha at some level of the program influences students to smoke tobacco from pipes and drink alcohol. Last year's month long Boktau event ended with much drinking at a late night party. 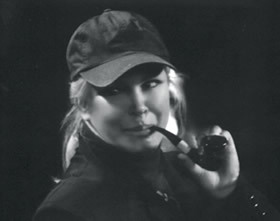 When Ramtha/JZ took to smoking a pipe in front of the highly suggestible students, pipe smoking became a group fad and ritual. JZ has had a smoking habit. Wine guzzling was a major ritual in the early days of Ramtha meetings--perhaps those days have returned. Melton reports nothing of this tobacco and wine side of the Ramtha group ritual. [The next RSE Boktau will be October 1 to November 1, 1998. Cost=$2100. A ten day "Assay" is $1100]. By smoking, chanting and breathing C&E style, the students hope to become as "enlightened" as any legendary shaman or "real magician" who can shape-shift the world at will. Ramtha allegedly teaches that alcohol and nicotine can help in this endeavor. Melton calls this "real magic" (p 100). They might part the Red Sea, raise the dead, freeze a rocket's flight in mid-air, make gold appear, predict the future. Psychic progress eventually leads to bodily "ascension" into the "Void" or ultimate spiritual state. The actual results, however, are far humbler and unconvincing to even the mildest skeptic. In my view, any small town, charismatic church makes the same claims to "miracles" and positive life enhancement as Ramtha students. The RSE may be far more expensive to attend than a Pentecostal church, but the results are no better. (Read Melton's report about the "life at Ramtha's school today" in chapter 7. One lady he met showed him new, adult teeth as a result of C&E). A naïve reader might find Finding Enlightenment impressive, filled with scholarly facts about Gnosticism and a rich description and history of the Ramtha "school." Melton's knowledge about Gnosticism is edifying, to be sure, but his history and impression of the Ramtha phenomenon leaves me with many criticisms. Comparing Ramtha/JZ to a "Willie Nelson or Madonna," Melton introduces us to the school by describing the scene of JZ Knight as Ramtha when "he" appears before "whoops and hollers" from one thousand people in an auditorium. But JZ "was more important than a mere Mick Jagger," says Melton, who may have been caught up in the enthusiasm. Melton says that a "student," J. O. Ault, assists him for the day, but he neglects to mention that Ault has been JZ's youngish companion and, according to Jeff Knight, her "lover" after she broke away from Jeff. Melton did not offer in depth information from Ault whose intimate experience of JZ/Ramtha must be noteworthy, if not compelling. Melton does define "New Age" and "occult" as these words have relevance when categorizing the Ramtha group. In chapter one, "JZ and Meeting The One," Melton recounts JZ's early life, her broken marriages and her uncanny psychic abilities which she seemed to inherent form her mother. Early in her life, JZ rebelled against orthodox Christianity, rejecting any notion of "Satan," and adopting reincarnation as a "truth." JZ was born Judith Hampton in 1946. According to her autobiography, her young life was difficult and marked by abusive, alcoholic men. Melton recounts a visionary incident JZ says she and other girls at a slumber party experienced, but then "forgot" or "refused to discuss." But JZ did remember it. Melton neglects to mention reports from JZ's childhood friends at that time who remember her falling to the ground, seemingly possessed by a male spirit that called itself "Demias" who spoke in a "male voice." "I have possessed this body for a long time," Demias reportedly said. The eyewitness stated this on 2 television programs, including the 20/20 piece in 1987, but JZ says it "never happened." He may neglect to mention this because he wants to avoid "hearsay" or to put anyone's beliefs "on trial." He cites an important 1940 California case, Ballard vs US Government (ran for several years with appeals, etc.) in which the judge stated just that--we cannot question beliefs in court no matter how bizarre we think they are. Melton seems to conveniently confuse scholarship with courtroom ethics and case law. In our open society, we have a right to freedom of speech, and we have a right to disagree with a belief or a procedure. I can almost imagine what an academic session might be like at the annual meeting (many thousands of religious scholars) of the American Academy of Religion, for instance, if they ran it like a courtroom. At times, in our litigious society, some scholars must consult with lawyers before they present a paper, but academic papers are peer reviewed. Ironically, ex-members are eyewitnesses to facts and experiences--that is admissible in courts of law, but apparently not in Melton's "academy." In a later chapter, Melton takes issue with 20/20's journalism, hinting that the report was biased because host Barbara Walters' husband had once been a believer in Ramtha. In preparing the show, 20/20's producer, Dave Doss, questioned me at length for leads and information, and I was able to direct them to some Ramtha students I knew in Santa Fe. They agreed to appear on camera. Judd Rose interviewed me for that show, but it was not used. The 20/20 team did use Professor Carl Raschke of the University of Denver as their "expert" to criticize Ramtha and the channeling fad that swept the New Age arena at the time. Melton attacks Raschke's statements on 20/20 by pointing out that Raschke had little direct experience of the group. In chapter one, "the One" a psychic told JZ about was, of course, Ramtha. When the couple lived near Seattle, JZ and her then husband, "Jeremy," played with pyramid power, another New Age fad that attributed psychic powers to pyramids. Melton uses the fictional name, "Jeremy Wilder," for JZ's husband, the name that JZ gave him in her autobiography. In Soul Mates, the man is identified as Mark Burnett, a dentist with occult leanings (Stearn, 119). This is one example in which Melton seems to bend to JZ's version of her story without corroborating or comparing the evidence for the reader. In another, a psychic woman who assisted JZ immensely to understand and develop her Ramtha channeling, is called "Mary Redhead." But Melton never mentions Anne-Marie Bennstrom, who, along with Jeff Knight, was a key influence and a constant presence on stage with the Ramtha show during the early to mid 1980s. Melton would have done well to interview Bennstrom. Melton mentions that many movie stars were attracted to Ramtha, but neglects to mention that JZ began to gain fame in 1980 when she channeled Ramtha for audiences in actor Richard Chamberlain's home. This is where Jeff Knight first met "Ramtha" after JZ invited him to the seance. While she was yet married to Burnett, JZ allegedly targeted Jeff as her "soul mate" when she saw his photo in an advertisement for a horse. Jeff had no experience with metaphysical spiritualism when he met JZ, and he told me he was awed if somewhat confused by this encounter with the "Ram." He and JZ were soon living together. Melton does report that Jeff was a "bisexual" who had an affair with a man during his marriage to JZ, and that he contracted HIV sometime before 1987. Jeff's homosexual life was no secret by the time he contacted me. By 1991 Jeff dropped out of the RSE, with the help of his dear friend, Geoff, who was his close companion until Jeff died in 1994. Geoff encouraged and helped Jeff to read (Knight, a brilliant equestrian, was "dyslexic") a critical paper I wrote about Ramtha for a lecture I gave in 1986. Ironically, the paper got to Jeff through a Ramtha student whose husband gave it to her in an attempt to save their marriage. She saw the paper as a threat to the group, so she wanted Jeff to pass it on to JZ. Jeff told me that the paper was the "icing on the cake" that confirmed his misgivings after ten years experience with JZ/Ramtha. According to Jeff, JZ often, but privately channeled another spirit, "Charles," a 19th century equestrian who advised them which horses to buy and sell. Jeff noted that rarely did the "channeled" horses meet expectations, but many were sold at inflated prices to wealthy Ramtha students anyway. Melton never mentions the Charles spirit. He also does not mention that JZ channeled "Jesus" (Yeshua) at least once--JZ/Jesus is on an audio tape I listened to many times around 1985. Apparently, JZ/Jesus did not go over very well with students. "Yeshua" was a harsh, accusatory person who ranted at times. The Arabian horse industry folks knew their horses and were not fooled by Ramtha's confidence in certain "steeds" from JZ's Messiah stables. I took a Messiah Arabian brochure from an Arabian horse show I attended in Albuquerque around 1984--the Messiah stud fees were modest to low compared to the best stables. Melton does not note that this is the primary reason so many investors were angry with JZ--they trusted the Ram's (or Charles') godlike wisdom about horses. 20/20 explicitly documented the manipulative advertising, but Melton does not. He reports only that JZ said "sorry" and eventually refunded money. He places blame on the general collapse of the Arabian industry, but not on JZ's fanatical leap into the horse business through channeling. Melton finds errors in Klimo's book Channeling, and he calls him a "rumormonger" for mentioning that many Ramtha students dropped JZ's cult after catching her "acting" like Ramtha. Melton does not mention what some of the students saw, including Jeff Knight. JZ has had a habit of smoking cigarettes, and sometimes would take breaks during hikes with students who believed that "Ramtha" was leading them. One of her business managers testified that he saw her go in and out of the Ramtha personality without the "trance" exercise she used on stage. This shocked him, and it dawned on him that it was all an incredible act. He left the movement. At that time hundreds of defectors from the Ramtha group opted for other channels; some went to Penny Torres-Rubin who channeled a Ramtha clone called Mafu. Others checked out the hugely successful Lazaris entity channeled by Jach Pursel. Klimo stated, "Lazaris adds a much needed credibility to this entire field" (Lazaris, NPN Publishing, 1987. Back cover notes). Klimo may not be a rumormonger, but he loses my respect when he promotes thinly veiled spooks like Lazaris. Klimo's entire, effusive apology for channeling lacks clarity, though he recites most of the skeptical objections to channeling--Melton takes him entirely too seriously. In 1988 there were reportedly 1,200 channels in Los Angeles area alone. Among the New Age milieu of channels, JZ Knight attracts a relatively large crowd of critics. Klimo's effect on her credibility was probably insignificant, certainly less than that of Penny Torres/Mafu who called JZ a fake on a 1988 Oprah Winfrey Show. Mafu claimed that the real entity had "left JZ." Melton does not report the significant Mafu conflict, nor that Anne-Marie Bennstrom supported the rival Lazaris enterprise by 1985. These are a few matters that are missing or understated in Finding Enlightenment. My last point has to do with the nature of the tests that certain "experts" performed on JZ while she was in her Ramtha mode. Melton tells us that the tests show that JZ is not a fraud, and that something extraordinary was physiologically taking place. The researchers, Stanley Krippner of the Saybrook Institute, parapsychologists Ian and Judy Wickramasekera, engineer Ganapati Roa of the University of Virginia, and others conducted the tests, that amounted to monitoring eight bodily functions. Melton tells us that Krippner and Wickramasekera ruled out fraud at a "scholarly" conference held at Yelm [WA] in February 1997. According to a reporter who attended, this conference was hardly "scholarly" as it was not open to critics who could ask the hard questions (see Connell). In my view, Krippner and his colleagues who tested JZ were enchanted saps and nothing less. Krippner should know better, but he has long been a psi believer (Gardner, 18; Gilovich, 160). The tests they administered were not cross-referenced, to my knowledge, with rigorous findings about other channels or mediums. For example, the Medjugorje visionaries in the former Yugoslavia have been tested repeatedly in similar but more rigorous ways (see: Laurentin & Joyeux, 1987). The Medjugorje visionaries submitted to many sets of tests by unrelated scholars and scientists. The key questions for Krippner and colleagues included whether Ramtha had an independent existence from JZ, or was she merely dissociating in an extraordinary way. JZ did rank high (to be expected, they reported) on the Absorption Subscale and the Dissociative Experience Scale, but they felt, properly so, that that did not establish fraud. Religious studies scholars, Robert Balch and Stephan Langdon recently published a paper criticising the J. Gordon Melton collaboration for a 1994 book about another theosophical sect, one that also has a middle-aged woman as it's only channel. "How the Problem of Malfeasance Gets Overlooked in the Study of New Religions: An Examination of the AWARE Study of the Church Universal and Triumphant" is a chapter in Wolves Within the Fold (Shupe, 1998). Balch and Langdon point out how Melton, et al, avoided and ignored what Irving Goffman (The Presentation of Self in Everyday Life, 1959) called "back-stage realities" when studying the CUT. What concerned Goffman was how readily researchers engage in "teamwork" while studying the theater or "stage reality" of groups to potentially discredit "back-stage" information and to prevent "leakage" about the same. Melton used some of this same AWARE team for the Ramtha study, and they all continued to not take ex-member statements or skeptical views seriously. Two excellent studies of fringe groups that did not ignore Goffman's warning were When Prophecy Fails (Leon Festinger, et al, 1956) and chapter 5 of The Communal Experience (Laurence Veysey, 1973). Festinger and his colleagues infiltrated a small channeling group near Chicago that predicted great earth changes, including floods that could end the world. Festinger was testing his theory of cognitive dissonance. The group got its directions from a Ramtha-like spirit called Sananda. The channel, named "Marian Keech" in the book, was probably Dorothy Martin who eventually settled in Arizona where she dabbled in Scientology. She continued to channel "space brothers" and Sananda until her death in 1992. The Festinger research team used a disguised participant/observer technique to study the group members, who were unaware of the study. Veysey, on the other hand, used an undisguised participant/observer approach to study a "New Age" New Mexico commune, the Synergia Ranch south of Santa Fe. Veysey communicated his intentions openly to the group for many months before his five week, full participation in communal life under the direction of "Ezra" (actually, Johnny Dolphin Allen, who became infamous as the cult leader behind the embattled Biosphere 2 project, 1991-93, in Oracle, Arizona). Veysey, like the Festinger team, was keenly aware of back-stage information. His critical analysis of the leader and the commune stood up to time in light of the continuing history of Allen's cult two decades later in the bogus Biosphere 2 project. [The project is a giant geodesic "greenhouse" that was supposed to be hermetically sealed for 2 years with eight humans inside. "Biosphere 1" is planet Earth; "2" was to be a miniature model to prepare for Mars. Outside air was secretly pumped into the flawed structure months after the first test began. for example, see "Profits of Doom" by Marc Cooper, Voice, July, 30, 1991; "Earth in a Bottle" by Jon Anderson, Chicago Tribune, November 20, 1994]. I doubt very much that Melton's happy study about Ramtha will remain as credible. In chapter eight, Melton concludes: "However, because the questions of pathology and fraud were answered, nonbelievers will have to come up with more creative alternatives" (156). Creative? Try simpler. Typical of parapsychologists who want to believe in the paranormal, Krippner and his colleagues missed an important opportunity to test the obvious. They needed wits, not instruments and psychological tests to see whether Ramtha was a separate, intelligent being. The Ramtha/JZ has produced many audio tapes, books, and videos to draw upon, along with interviews with members and ex-members. Ramtha/JZ has given private consultations to paying customers (Shirley MacLaine reports on these sessions in Dancing in the Light), so he is capable of private conversation. But Ramtha is trademarked like Mickey Mouse, meaning that no one can legally channel or use "Ramtha" without getting sued by JZ, so we cannot cross-check through another medium. But we do not need the opportunity. JZ/Ramtha walks and talks relatively freely among devotees, and s/he has appeared on television talk shows, publicly stating "outrageous" things and stroking his "beard." This is not a timid spook. But he is oddly inconsistent. According to JZ (A State of Mind, 1987) in the beginning years [1977-80] Ramtha would follow her around asking odd questions like, "What be a Safeway," as if he just reappeared on earth after 35,000 years with no knowledge of our food market life. Yet he seemed to know the most secret details of our government, how the "Graymen" were running it and why we should avoid "debit cards." He demonstrates no capacity for another language, but speaks in an odd, British accent. Ramtha's accent and postures often resembled actor Yul Brunner his The King and I role. It is easy to note that Ramtha is suspiciously familiar with our culture and religions despite "his" clumsy affect in language. We also know that Ramtha claims to be part of the Great White Brotherhood of ascended masters introduced to us mainly through Madame Helena P. Blavatsky and her Theosophical Society during the late 19th century. This is significant because these alleged ascended masters "do" operate spiritually outside of time and space. Through their mediums or channels, they claim access to instantaneous, "unlimited" knowledge and psychic power. Ramtha must know who his friends and enemies are. Ascended masters like Ramtha can communicate with one another according to the mythology. If an ascended master, or Ramtha, can describe complex philosophies, the airships of Inner Earth and extra-terrestrial civilizations (see Ramtha dialogues on Inner Earth and Jehovah), they can certainly describe through their medium much simpler things. This is my primary rule for this test: If the channel/spirit or either aspect refuses to comply with such a simple test, we automatically conclude that there is no spirit (or "autonomous complex" as Carl Jung called it) present. Normally, I have had to set up the channeled "spirit" to trap them into such a test. Most channels or mediums are a clever lot and will squirm out of the obvious traps, like "how is my dead sister" when you do not have one. When asking a question it is important to know what the channel would not know about your question, but it must include something the channeled spirit claims to know. This is not unlike the tests Catholic exorcists have used to determine if a "demon" were present. Can the spirit speak in a language totally unknown to the possessed? Can the spirit move physical objects? Does the room suddenly turn cold for no apparent reason? Can the exorcist team rule out psychopathology? And so on. But our test is not to determine the need for exorcism. We will merely try to determine the existence or quality of a spirit, not to judge or eliminate it. We already know that Ramtha knows another master called Jesus ("Yeshua ben Joseph" in JZ's jargon). Yeshua is an ascended master who JZ recognizes and has channeled, as indicated above. Ramtha may recognize another master if you ask-Blavatsky's KH (aka Koot Hoomi or Kuthumi) would do as the Ram should know that master well. After all, they are part of the same occult lodge, the Great White Brotherhood. In any case, the important factor is to get Ramtha to admit that he knows another ascended master, then ask a series of "yes" questions. Have you known Jesus (KH) for long? Are you aware of esoteric groups or persons that Jesus (KH) has worked with? Would you or Jesus (KH) be aware of people who are merely faking to be your channels or messengers? (JZ sued a European woman successfully to stop her from channeling Ramtha. Remember that Ramtha carries a trademark). All of these are "yes" answers because they are rhetorically sound-Ramtha has no choice but to answer yes, unless he wants to lie like an idiot. Do not put that past him, however. He may be "unlimited," but he can be "outrageous." For this next step you will have had to encounter many serious students and channels of these same masters, facts about actual people who JZ would not know. There are literally thousands to choose from. Then ask: "Ramtha, I know of someone in [Indianapolis] who has studied your teachings and channels Yeshua. Her name is [Mary Doe]. Describe that person to me? Please tell me what she is working on now." Use real people and guarantee that the person and project is real. That is the kind of question, simple, that does not take a physicist or an occultist to answer. If, by chance, Ramtha gives the right answers, then JZ is either psychic, lucky, or a spirit is really there. Or your questions were poorly designed. The "hits" could also be due to a number of weird explanations. I doubt this will happen, but you have to be prepared to probe further, set up new tests, and not be shocked by the results. During the early 1980s, when the Medjugorje visionaries were tested, they submitted to several doctors, scientists and theologians over a period of years. The tests were more thorough and the visionaries more accessible to scrutiny than JZ. Krippner and his colleagues have not eliminated fraud, as Melton claims. They have only opened the possibility to longitudinal studies by less credulous, more thorough scientists, but I doubt seriously that this will ever happen. One gaping difference between the Medjugorje seers and JZ is that the seers were not "possessed" by the subject of a vision in the shamanic sense, whereas JZ is. Their vital signs and brain waves remained the same during the group ecstasy, whereas Ramtha/JZ showed a difference during the possession. Any research team should include tests for the integrity of a channel or visionary. If the "self" is intact and honestly presented as indicated in various tests of the Medjugorje visionaries, there may be a strong possibility that they are speaking truth. Still, this does not prove that the Virgin Mary in their vision is "real." The Medjugorje visionaries maintain integrity during ecstacy; JZ is disintegrated. With JZ/Ramtha we have a corrupted JZ who is "confused" with Ramtha when she is apparently possessed. This still does not disprove that some spirit is present in JZ, but it shows that she is an essential part of the message--no JZ, no Ramtha. And Ramtha has yet to prove that "he" knows anything that JZ does not or can not know, in my view. No, Krippner and his team have not ruled out fraud in the case of JZ/Ramtha, if what Melton and the press release (Connell) have reported thus far is any indication. Connell, Joan. March 8, 1997. "The New Age Spiritualist and the Old School Scholars" (Washington Post) "There were perhaps 1,000 people there, perhaps two-thirds of whom were regular students. You were encouraged to hold a picture in your mind, scream and do breathing exercises as you listened to this loud, loud music," Crutcher [John] recalled. "We were surrounded by this mass of craziness. I was sitting next to this very vulnerable young woman who was new, and it was really disturbing me to think that she may have felt, freaky as it was, that we had been through something meaningful."